This large heavy earthmoving equipment was purchased by National Mining Services, a part of the National Group of companies owned by Managing Director Mark Ackroyd. The new Liebherr R 9800 Excavator was delivered in pieces to the Boggabri Coal Mine on 13th July 2018 and was subsequently assembled over a one month period. The R 9800 Excavator has a load capacity of up to 92 tons per pass (up to 48m3), making it one of the most productive excavators on the market. It has an operating weight with backhoe attachment of up to 882 tons and an impressive engine capacity of 2,984 kW / 4,000 HP. Three new 'ultra-class' Komatsu 930E Dump Trucks were also handed over to Idemitsu. The 930E's are notorious for being difficult to source and are some of the larger dump trucks available on the market. The 930E has a gross operating weight of 553 tons, with a load capacity of up to 320 tons per load and a powerful 2,014 kW / 2,700 HP engine. On 31st August 2018, Mark Ackroyd met with Ray Balks of Idemitsu, General Manager of Operations at the Boggabri Coal Mine to celebrate this important milestone. "The equipment supplied by National Mining Services was fully operational on 24th August and is expected to support our coal production targets into the immediate future" stated Ray Balks of Idemitsu, General Manager of Operations at the Boggabri Coal Mine. "We currently contract National Mining Services to supply our operations with 'ultra-class' heavy earthmoving equipment, which has added significant value to our operations." Mark Ackroyd, Managing Director of the National Group suggested that "the mining industry is experiencing the early signs of a recovery, with many companies such as Idemitsu steadily increasing production through the use of 'ultra-class' equipment." "This highlights a turning point for the mining industry and the Australian economy as a whole. 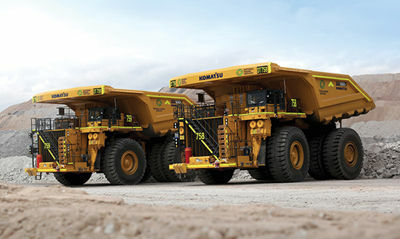 After several years of a contracting market, it is promising to see large scale mining operations investing more resources into 'ultra-class' heavy earthmoving equipment in order to increase production." "As for the National Group, we are currently experiencing exponential growth due to the strength of our partnerships, with relationships at the very core of our business. 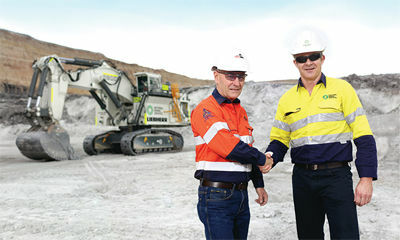 We have built a strong industry reputation with key brands such as National Mining Services, which is why the National Group services some of the largest companies in the industry such as Idemitsu" said Mark Ackroyd. The National Group comprises of leading companies from the mining, resource, logistics and personnel supply industries. National Mining Services is a part of the National Group of companies and provides comprehensive mining solutions to some of Australia's largest and most respected companies.